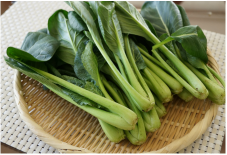 This is a vegetable similar to spinach, but with a more firmer texture and different nutrients. If you want iron, eat spinach, if you want calcium go for komatsuna which has 3 times of that of spinach. I personally like komatsuna as it is easier to cook and the root is nice and sweet. How to cook: Unlike, spinach, it does not contain oxalic acid (cause of kidney stones) so you don't have to boil it to get rid of it. Simply chop it up and stir fry. To efficiently absorb its calcium, cook it together with ingredients that contain protein or fat like tofu and soy products, cheese, and meat. 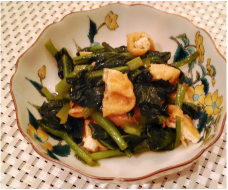 Spinach and Aburaage (Fried Tofu) stir fry. 1. Wash and rinse the komatuna. (Rinse well between the roots to get the dirt out). Chop it into match stick length. 2. Heat the skillet and stir fry the Komatsuna for 1-2 min (until it is slightly soft). Add the chopped Aburaage. Fry for another 30 sec.